During the 2018-2019 academic year, Lian Laudy, a master student in the Systems Biology research master at Maastricht University, will write her thesis in the team. Lian previously completed her BSc in Health Sciences at Maastricht University. 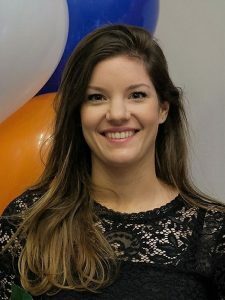 As part of her MSc thesis, she will work on the simulation of long-term ion-channel regulation via calcium-dependent signaling cascades. During the annual meeting of the German Cardiac Society, which took place from April 4-7, 2018 in Mannheim, Germany, Jordi Heijman was re-elected as member of the nucleus for the working group “Cellular Electrophysiology”. Jordi has been a nucleus member since 2016 and will now continue to promote cellular and translational electrophysiology within the German Cardiac Society until 2020. Besides organizing scientific sessions during various meetings, the nucleus is also working on a ‘state of the art’ paper on the role of basic science in clinical electrophysiology. A lot has happened already in 2018. Besides teaching and writing grant proposals, a number of our papers have appeared in print. 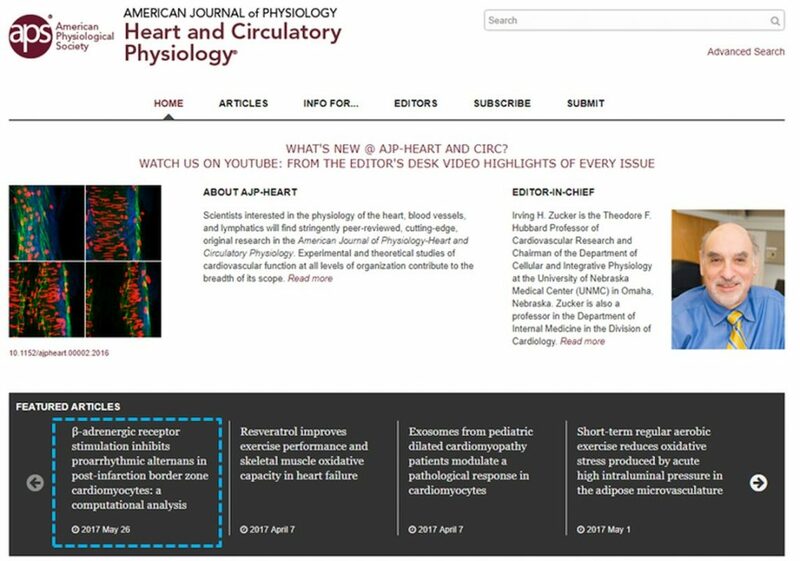 These include an original research article on the role of type-1 muscarinic receptors in the regulation of the acetylcholine-activated potassium current (in Int J Cardiol), as well as reviews on macromolecular complexes (in Herzschrittmacherther Elektrophysiol) and translational challenges in atrial fibrillation (in Circ Res). An overview of all publications can be found here. We wish everyone a happy holiday season and a happy, healthy and successful 2018! We are grateful for the many interesting projects and collaborations that we have had the opportunity to work on in 2017 and are looking forward to continuing these successful collaborations (and establishing new ones!) in the year to come! fibrillation? Int J Cardiol. 244:202-203. Fibrillation? Circ Arrhythm Electrophysiol. 10(10). pii: e005776. heterotrimeric G-protein signaling by NDPK/NME proteins and caveolins: an update. Lab Invest. Oct 16 Epub ahead of print. The Heijman Lab – August 22, 2017. From left to right: Bart van Sloun, Fahra Aziz, Pegah Erfanian-Trudrung, Marcia Vagos, Jordi Heijman and Henry Sutanto. On August 22, the entire team came together for pizza and drinks to celebrate the summer and the excellent results achieved so far this year! The month of July was a festive month for the lab with two graduation ceremonies! On July 12, 2017, Bart van Sloun completed his Master thesis internship “From Form to Function in Heart Muscle Cells” with the official graduation ceremony of the Master Systems Biology of Maastricht University. Bart will continue to work in the lab over the summer before starting as a PhD student at the Maastricht Center for Systems Biology on October 1. 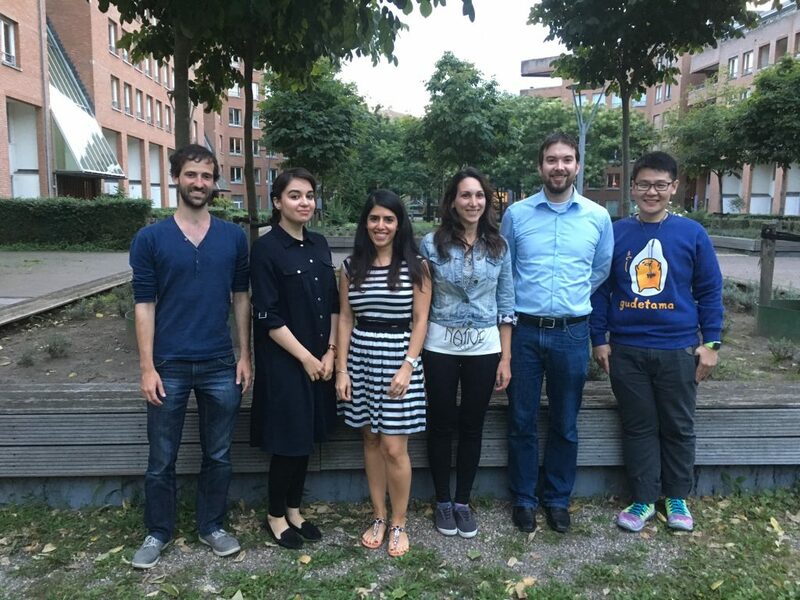 On July 19, 2017, Pegah Erfanian-Trudrung successfully defended her PhD thesis “Experimental Analysis and Computer Modeling of the Sarcoplasmic Reticulum Ca2+-ATPase in Atrial Fibrillation” at the Faculty of Medicine, University Duisburg-Essen, Germany. Pegah is currently working as a pharmacist in Dortmund, Germany. Many congratulations to both for these important achievements! Our recent article about the role of β-adrenergic receptor stimulation in repolarization alternans in post-infarction border zone cardiomyocytes published in Am. J. Physiol. Heart Circ. Physiol. has been selected as featured article! As part of this nomination, a podcast was recorded in which we discuss the impact of our work with Dr. Crystal Ripplinger (consulting editor) and Dr. Thomas Hund (external expert). This podcast is now available on the AJP Heart podcast website. R epolarization alternans has been implicated in ventricular arrhythmogenesis and sudden cardiac death, particularly in the infarct border zone (BZ). There exist conflicting data about the effect of sympathetic hyperinnervation on alternans formation and arrhythmogenesis in the BZ. However, detailed experimental characterization of the role of hyperinnervation in BZ arrhythmias is challenging due to the numerous distinct effects of post-infarction remodeling and the diversity of species-specific (sub)cellular mechanisms controlling calcium handling, alternans, and other pro-arrhythmic factors, all of which are modulated by sympathetic stimulation. In this manuscript, we characterized the interplay of BZ electrophysiological remodeling and sympathetic stimulation on alternans formation by fusing an existing state-of-the-art computational model of βAR stimulation in the canine ventricular cardiomyocyte with a model of post-infarction electrophysiological remodeling in the BZ. 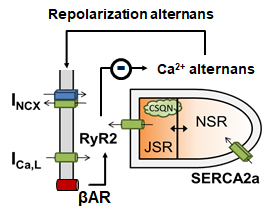 Our results indicate that βAR stimulation can indeed suppress alternans and we identified a critical role for the regulation of SR calcium release, both through activation of RyR2 channels and indirectly through regulation of SR calcium load, in the suppression of alternans. A brief communication investigating the role of inhibitor-1, a modulator of protein phosphatase 1 (PP1), in the regulation of the cardiac ryanodine receptor type-2 (RyR2) channel appeared online today. The work from the group of Dr. Stefan Neef, University of Regensburg, Germany, to which we contributed, demonstrates that I-1 acutely modulates the activity of the calcium/calmodulin-dependent kinase II (CaMKII) by regulating PP1 activity. However, although ablation of I-1 should thus limit CaMKII-activation, CaMKII activity was exaggerated under β-adrenergic stress upon chronic loss of I-1 in knockout mice. Experimental and computational studies suggest that this is due to chronic upregulation of the exchange protein activated by cAMP (EPAC), leading to augmented CaMKII activation.